What Are the Benefits of a Greenhouse? A greenhouse is simply any structure in which gardeners control atmospheric conditions to grow plants. Greenhouses can be as small as a box that can sit on a window ledge or as large as buildings covering thousands of square feet. The principle behind all of them is that with the right investment of time and money, gardeners can replicate many conditions within a greenhouse and grow countless plant species. Gardeners who grow plants in greenhouses extend their growing season by starting seeds earlier in the season than they could start them outdoors. At the end of the season, plants will survive longer inside the greenhouse than those subject to frost outdoors. Gardeners extend the season by controlling the light, temperature and moisture inside the greenhouse. Greenhouse gardeners choose the quality and quantity of natural light in the greenhouse with the placement of the greenhouse on the property, as well by choosing glazing material. As the gardeners of The University of Arizona College of Agriculture and Life Sciences Extension Service note, "[t]he primary concern is for the maximum quantity, duration and uniform availability of solar radiation for plant growth." Growers control greenhouse temperatures with sensors that measure the temperature, heaters to raise the temperature and fans and vents to lower the temperature. Gardeners provide the right amount of moisture for the plants by watering and raising and lowering the humidity levels; in much the same way as they do the temperature. Greenhouse growers can grow a wider variety of plants than they might otherwise be able to grow outside of the greenhouse environment. Gardeners in the Northeast U.S. can create a dry, arid environment to grow plants normally found in the Southwest portion of the country. 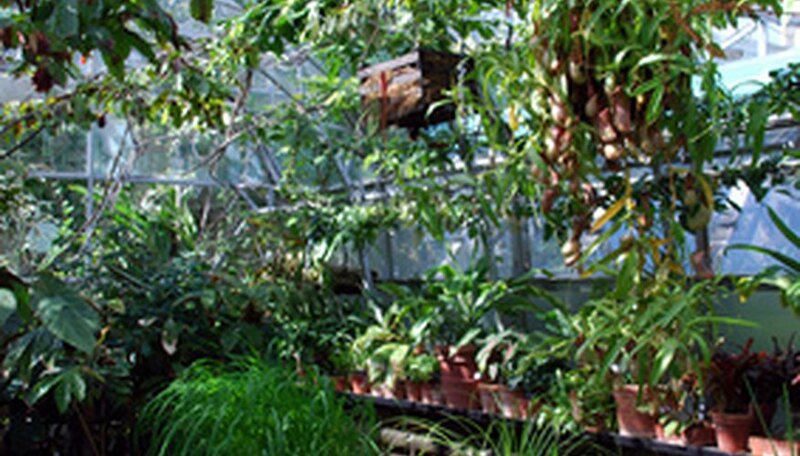 Gardeners in the Southwest can create humid greenhouses to grow tropical plants. Gardeners are limited only by the soundness of the greenhouse and the amount of money they are willing to invest to maintain optimal growing conditions. The Greenhouse Buyers Guide brings home this point with the example of expensive orchids in a northeast greenhouse. Such gardeners may invest in automated sensors, roof covers, misters and alarms tied into the house or a cell phone to alert the gardener to problems. An enclosed greenhouse helps gardeners protect plants from predators and pests, including squirrels, moles and deer. While some smaller pests, in particular rodents, may be able to enter through vents, windows and open doors, the problem is much less severe within the confines of a greenhouse than on the outside. Greenhouse gardeners can take additional measures to try to guard against garden pests with screens and traps. Greenhouses without a solid floor may need greater protection to keep out burrowing pests. Gardeners can tend to their plants comfortably while it rains outside, in the dark or in the heat of the day. Greenhouse gardening means people do not have to curtail their gardening activity when the weather is inclement or if it is dark out, because they set the conditions in the greenhouse. This gives gardeners more hours in the day to tend to their garden which means more people will be able to find time to garden. What Plants Grow Best in a Greenhouse? What Are the Benefits of a Greenhouse in Hawaii? What Are the Dangers of Having Rats in the Walls of an Apartment?